Golovkin vs Jacobs on March 18 at MSG – Breaking News! Middleweight champions Gennady “GGG” Golovkin and Danny Jacobs have reached a deal for the two of them to fight each other early next year in the first quarter on March 18th on HBO PPV from Madison Square Garden in New York, Boxing 247 is happy to report. This is the fight that the fans have been waiting for. No, it’s not Golovkin vs. Canelo Alvarez, but it’s a fight between guys that actually want to fight each other NOW rather than letting the fight marinate needlessly. The deal was reached on Saturday by Golovkin’s promoter Tom Loeffler and Jacobs’ manager Al Haymon. With a deal reached between GGG and “The Miracle Man” Jacobs, it means there won’t be a purse bid this Monday on December 19th. That would have been bad news for the fight, because either way it would have likely led to oblivion with the Golovkin-Jacobs fight imploding. The WBA mandated 75/25 purse split would have gone into effect if it had gone to a purse split, and that would not have made the 29-year-old Jacobs a happy camper. Getting only 25% of the loot for the Golovkin fight would have been a raw deal for Jacobs. He might have balked at taking the fight under those conditions. If the fight had gone to a purse bid and Golovkin and his promoter Loeffler had lost the bid, then Haymon might have put the fight on Showtime. 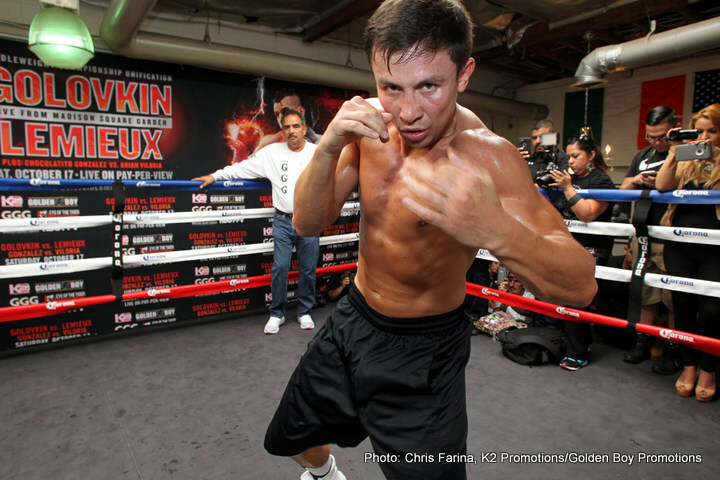 Golovkin is under contract with HBO to have his fights televised on their network. Golovkin might have had to pull out of the fight. There are already a lot of boxing fans grumbling at now having to pay to see Golovkin fight Jacobs on HBO PPV rather than on HBO Championship Boxing. It’s not entirely the news the fans wanted. They wanted to see Golovkin fight Jacobs, but they didn’t want to have to pay $60 to see the fight. With many of the good – but not great – fights ending up on PPV nowadays, it’s a real disappointment for some fans to learn that they’ll have to pay to see the Golovkin-Jacobs fight. Some fans think that Jacobs has been protected most of his career other than his fights against Peter Quillin and Dmitry Pirog. With UFC making really great fights almost every time out, boxing is trailing behind when you see fights that probably have no business being put on PPV winding up being sold to the fans. That means fewer and fewer fans see those fights. Golovkin vs. Jacobs could wind up being a more competitive fight than Golovkin vs. Saul Canelo Alvarez. Jacobs at least has the size, speed and athletic ability to potentially beat Golovkin. The 5’9” Canelo appears to be made to order for Golovkin. Canelo is someone who may not last more than a handful of rounds against GGG when/if they face each other next September. Jacobs could be the second best middleweight in the division behind Golovkin. You can already say that Jacobs is No.2 behind GGG, because Billy Joe Saunders looked terrible in his last fight in defending his WBO title against Artur Akavov. You are here: Home / Boxing News / Golovkin vs Jacobs on March 18 at MSG – Breaking News!